Today, we're closed. See all hours. Driving Range - NOW OPEN! 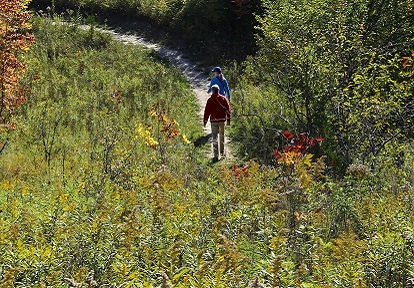 Experience nature’s gifts at Bruce’s Mill Conservation Park, as you walk along the forest trails, zip your way through the high tree canopy, and taste the sweet maple syrup during the Sugarbush Maple Syrup Festival. A spring tradition at Bruce’s Mill. 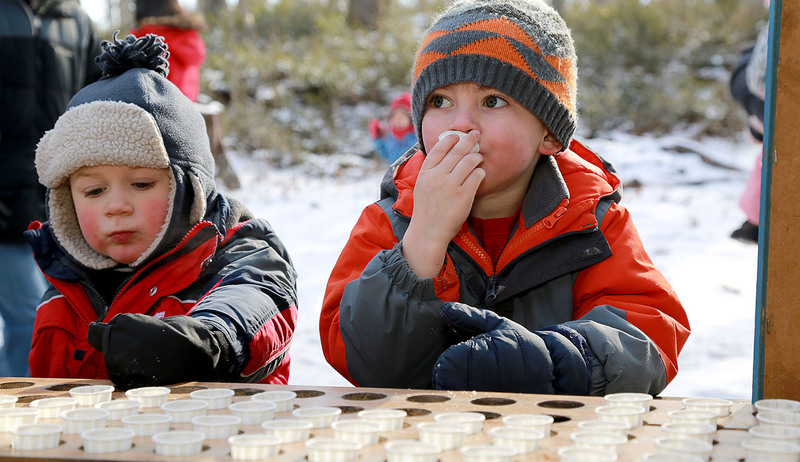 Come out and experience our NEW maple syrup trail. Enjoy demonstrations, wagon rides, activities … and, of course, pancakes with real maple syrup! Special family fun activities on weekends and March Break! Parks members receive free entry to the festival. 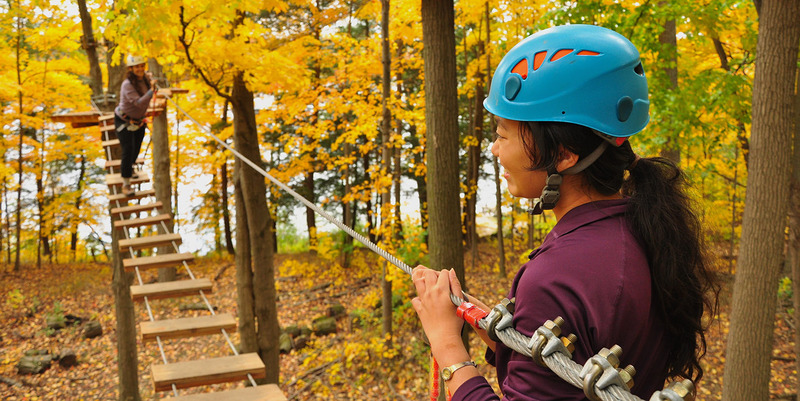 Aerial Park features FIVE tree top aerial courses made up of Zip Lines, Wooden bridges, Tarzan Swings and more! * Treetop Trekking age, height, weight restrictions and course rules apply. Children and the young at heart can let their imaginations lead the way while exploring Treewalk Village at Bruce’s Mill Conservation Park. Totally enclosed in eight-foot tall hammock nets, Treewalk Village is perfect for ages 2 and up. There is no need to wear safety harnesses while climbing from tree to tree! 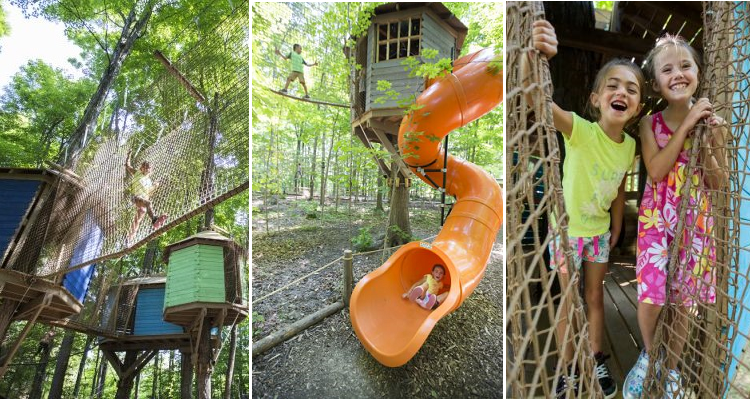 Descend to the ground on slides, crawl through a network of tunnels, and play on the Treewee Walk obstacle course! Enjoy a new, professionally designed facility, in a natural park setting! Hours of Operation: Monday – Friday 11:00 am to 7:00 pm. Saturday, Sunday and holidays 9:00 am To 7:00 pm. Call 905.887.8695 for daily hours and information. GOLF LOVERS: Enjoy golfing at Bathurst Glen Golf Course! LEARN MORE. Escape the city and let nature be your guide on the trails at Bruce’s Mill. Step onto a winding boardwalk that leads you through bright fields into the forest canopy. Follow a wooden bridge across a soft stream, navigate the forest’s floor, and discover the gifts that nature has to offer. The lush, green outdoor settings, combined with friendly staff will ensure that your next picnic will be a memorable one. For more information, visit www.picnics.ca. 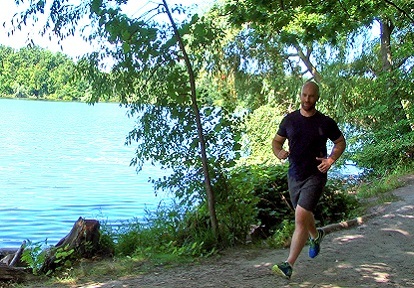 During the fall, Bruce’s Mill Conservation Park plays host to a number of cross-country races. The large shade trees offer the perfect conditions for training and competition. Our friendly staff has plenty of experience hosting cross country runs and will help make your next race a success. Bruce’s Mill Conservation Park is a great place for day camps and day cares to explore nature’s playground during the summer months. 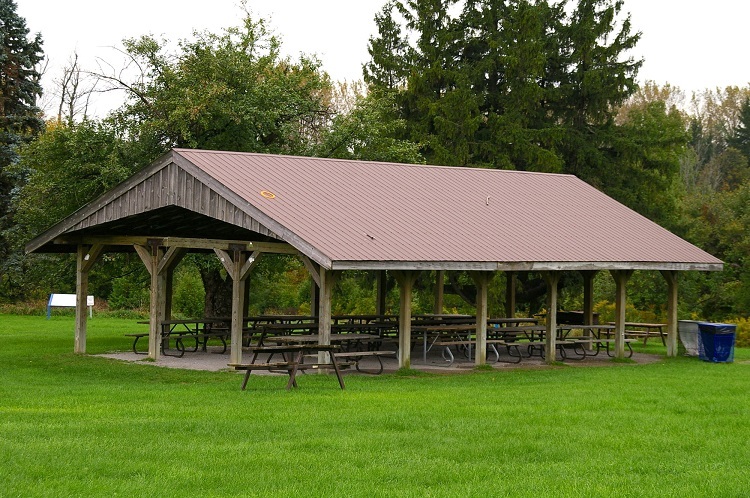 We offer an ideal location with many areas, picnic shelters for lunch and snack times, open fields for sports and plenty of washrooms. Special permit pricing applies. Looking to add some rustic charm to your wedding day? Then consider the Chalet at Bruce’s Mill Conservation Park. For more information, date availability or to book an appointment to visit the facilities, please call 416.667.6295. To book Bruce’s Mill Conservation Park for group activities, please call our customer service department at 416.667.6295. Chalet is fully accessible with men’s and women’s accessible washroom facilities. Picnic sites have accessible washroom facilities. Pets are kept on a leash no longer than 2 metres at all times. Pets are not permitted in the Aquatic or Visitor Centres. A maximum of three pets per person/family. Pets are never to be left unattended. For more information, please read our Domestic Animals Policy. 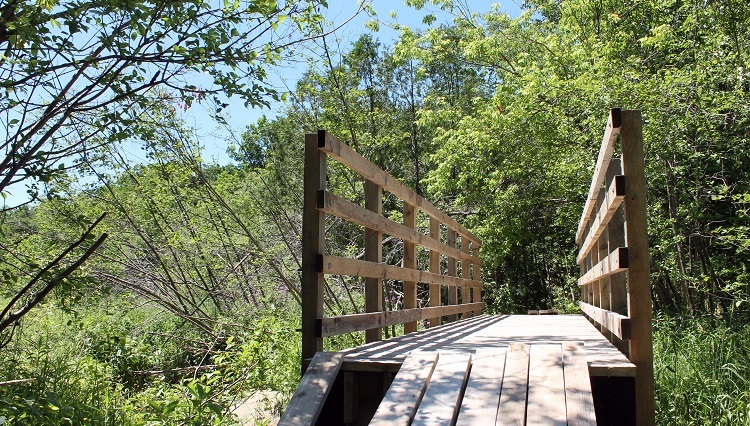 Bruce’s Mill Conservation Park is open weekends only from May 11 – June 24 and September 4 – October 14, 2019. Open daily from June 24 – September 4, 2019.